Careful a sudden News Release could turn your company upside down in a flash or drive it to success. A watchful eye on the gold, silver and copper prices are crucial as they constantly change throughout the game. Are you going to play it safe and sell out?... Or will you gamble and mine your property with the speculation of higher prices and richer profits. To take your junior mining company with a paltry 2 million and build a successful exploration and mining empire, amassing properties along the way. Players will search the globe for world class deposits of gold, silver or copper. Once found the players must choose to sell out and play it safe, or gamble and go long. Players will want to pay close attention to the Metal Market Index chart in order to time their purchases and sell offs for maximum profitability. 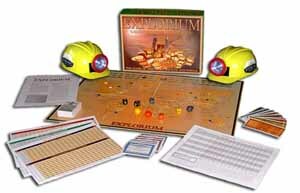 Wily negotiating and table talk is an exciting part of explorium and is encouraged. Beware... THE PACE IS FAST! THE DEBT IS HIGH! AND THE PAYOFFS ARE HUGE!! Our global newswire cards will give an exciting spin on the political developments in each country. The player with the highest net worth (assets minus debt) by the end of the game is the real tycoon!!! Bright and engaging 18" x 24" World Map with all countries, seas and oceans labelled. 200 Global Newswire Cards with up-to-the-minute historical, political, and culture-specific facts. Great learning tool for social studies, history, and economics. Exciting and factual Metals Market Index Chart priced in the appropriate ounces and tonnes. Teaches how metals market movements affect corporate finances. Set of Easy-to-Understand Rules with many examples and diagrams. It is so easy to play and extremely realistic. Custom colored and designed full-size Money. The larger denominations will excite players with 'billionaire' attitudes. Debt Notes will make players/miners accountable for billions of debt borrowed to finance mines. Innovative and addictive playing system.